"I don't think I'm alone in having this feeling as a North American: it was the best of times, it was the worst of times. In fact, we still are clinging to this unbelievable prosperity and safety, good health, and yet the abyss is there, at pretty much every compass point and more and more people are becoming aware of that abyss and the various forms it takes. It's an odd time to be alive." -- Novelist and memoirist Jonathan Franzen. The dirty secret about global warming is this: We have no solution. About 80 percent of the world's energy comes from fossil fuels (coal, oil, natural gas), the main sources of man-made greenhouse gases. Energy use sustains economic growth, which -- in all modern societies -- buttresses political and social stability. Until we can replace fossil fuels or find practical ways to capture their emissions, governments will not sanction the deep energy cuts that would truly affect global warming. -- Excerpted from an op ed piece by Robert J. Samuelson in the January 7, 2007 edition of the Washington Post. Many economists in the United States favor a carbon tax over cap-and-trade, mainly because the complexity of cap-and-trade systems opens the door to political mischief. The European trading system was captured by lobbies: Permits were given away rather than auctioned, which was a windfall for incumbent polluters, and permits were so plentiful that their market price was too low to deter emissions. Equally, the Clean Development Mechanism, set up to allow the purchase of pollution credits from poor countries, has turned out to be farcical. Chinese factories are being engineered to maximize greenhouse emissions, then re-engineered to generate pollution credits by reducing them. The upshot is that Westerners pay China vast sums for pollution credits. Global warming carries on. -- from the New York Times, November, 2007. The much anticipated report of the U.N.'s Intergovernmental Report on Climate Change, written by the leading international network of climate scientists, was released on February 2, 2007. The report states that global warming is unequivocal and that human activity is the main driver, very likely causing most of the rise in temperatures since 1950. Achim Steiner, executive director of the United Nations Environment Program said “Feb. 2 will be remembered as the date when uncertainty was removed as to whether humans had anything to do with climate change on this planet. The evidence is on the table.” In covering the day's news events, television networks place what they think was the most important news story of the day at the beginning of the national newscast. CTV news placed this story third, behind a story detailing the crash of a radio station helicopter in which no one was killed. 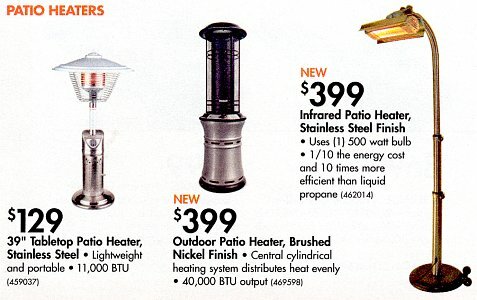 Available at Home Depot in Canada, March, 2007. 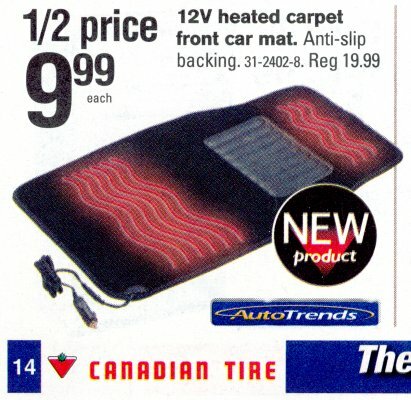 And, not to be outdone, Canadian Tire offers environmentalists in the True North this delightful item. Of the 41 industrialized nations monitored by the United Nations, 34 increased their greenhouse gas emissions between 2000 and 2004. In the United States, source of two-fifths of the industrialized world's greenhouse gases, emissions grew by 1.3 percent in that period, and by almost 16 percent between 1990 and 2004. In 2007 cars sold in the United States must achieve 27.5 miles per (U.S.) gallon. 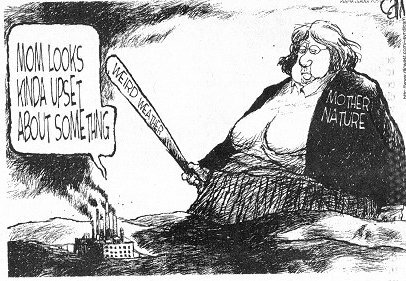 This figure has not changed since 1984. This is an excerpt from a letter to the syndicated "Tom and Ray" newspaper car advice column: Dear Tom and Ray, while on my evening walk, I went past a small SUV with the engine running. On the return leg of my walk, the engine was still running. At the completion of my walk, I went back to check the vehicle. It was still running, so I went up to the house and asked the owner if she knew her engine was running. She was charging her cell phone! Thomas Homer-Dixon has taken off the gloves with humanity. No more talk of what might occur. The 6.7 billion of us are driving too fast in the fog on the wrong road. A crash is inevitable. The 50-year-old theorist and director of the University of Toronto's Trudeau Centre for Peace and Conflict Studies says matter of factly in an interview: "Yes, there will be some form of breakdown. I feel pretty confident of that." For instance? "We're going to lose some coastline." Throw out the old maps. Think submerged cities. The time for a pre-emptive fix to global warming has passed. -- Michael Valpy in a Globe and Mail article on Thomas Homer-Dixon, November, 2006. Unimaginable quantities of methane — a greenhouse gas 20 to 25 times more potent than carbon dioxide — are stored underground in the Arctic and some of it is leaking out. The consequence of all that seeping methane has become one of the biggest questions in climate science. But one thing is certain: The fact it hasn't been factored into previous global warming predictions means forecasts even as recent as the 2007 report from the Intergovernmental Panel of Climate Change are too conservative. Methane, a carbon compound, is stored in organic material frozen into permafrost and in vast underwater deposits called hydrates — a slushy blend of methane and water. Estimates are that there could be as much as 10,000 gigatonnes of carbon in the hydrates and another 7.5 to 400 gigatonnes in the permafrost. Some researchers say there's enough carbon in underground methane — including large deposits under tundra lakes in the Mackenzie Delta and along Canada's Beaufort Sea coast — to equal the carbon from all the Earth's remaining deposits of oil, coal and natural gas combined. A World Wildlife Fund report has called methane the globe's single biggest climate threat. -- From a news story in the Globe and Mail, September 2009. Indonesia is second only to Brazil in terrestrial biodiversity and is No. 1 in the world in marine biodiversity. Just one and a half acres in Borneo contains more different tree species than all of North America — not to mention animals that don’t exist anywhere else on earth. If we lose them, some of the rarest plants and animals on the planet will simply disappear forever. And we are losing them. Market-driven forces emanating primarily from China, Europe and America have become so powerful that Indonesia recently made the Guinness World Records for having the fastest rate of deforestation in the world. Indonesia is now losing tropical forests the size of Maryland every year, and the carbon released by the cutting and clearing — much of it from illegal logging — has made Indonesia the third largest source of greenhouse gas emissions in the world, after the United States and China. Deforestation actually accounts for more greenhouse gas emissions than all the cars and trucks on Earth. -- from Thomas L. Friedman's op-ed column in The New York Times, December 16th, 2007. In 2003 the journal Science reported on the catastrophic decline of Earth's marine life. The article, by Ransom Myers and Boris Worm of Dalhousie University in Halifax, said that over the last 50 years commercial fishing has removed 90% of the larger fish species -- cod, tuna, swordfish, billfish and sharks -- from the world's oceans. In November of 2006, Science published a paper contributed to by 14 biologists which concluded that, at the current rate of exploitation, there will be no fish left in the sea in 40 years. In August of 2007 residents of the Italian village of Castiglione di Cervia began to fall ill with an unidentified malady. After a month of investigation, Italian public health officials discovered that the people of Castiglione di Cervia were suffering from a tropical disease, chikungunya, a relative of dengue fever normally found in the Indian Ocean region. Symptoms of chikungunya include weeks of high fever, exhaustion and excruciating bone pain. It is spread by tiger mosquitoes which have, until recently, been able to live only in tropical climates -- they can now thrive in a warming Europe. “This is the first case of an epidemic of a tropical disease in a developed, European country,” said Dr. Roberto Bertollini, director of the World Health Organization’s Health and Environment program. “Climate change creates conditions that make it easier for this mosquito to survive and it opens the door to diseases that didn’t exist here previously. This is a real issue. Now, today. It is not something a crazy environmentalist is warning about.” -- Adapted from an article in the New York Times, December, 2007. In 2006 the insurance industry began declining to insure property which is too close to the ocean. Allstate has decided not to write new homeowners insurance in the five boroughs of New York City -- Manhattan, Brooklyn, the Bronx, Queens and Staten Island, plus Westchester County, just north of the city, and the counties that make up Long Island -- Nassau and Suffolk. It believes that it is possible in the foreseeable future for a category 3 hurricane to funnel straight north up New York Harbor pushing a wall of water perhaps 15 feet tall up Broadway toward the second-story windows of Wall Street. In 2007 State Farm, Mississippi’s largest insurer, decided to discontinue selling new policies on homes and small businesses in that state because of its vulnerability to hurricanes. Ten of the 20 most costly natural disasters have occurred during the past five years — all 10 of them hurricanes, typhoons or tropical storms. The four hurricanes in Florida in 2004 (Charley, Frances, Ivan and Jeanne) collectively totaled more than $29 billion in insured losses; Hurricane Katrina is estimated to have cost insurers and reinsurers $45 billion. Peter deMenocal, an expert on ancient climates at Columbia University, worries that global warming will destroy modern civilization, just as abrupt climate changes caused earlier civilizations to collapse. "The thing they couldn't prepare for was the same thing that we won't prepare for, because in their case they didn't know about it and because in our case the political system can't listen to it." A major source of CO2 emissions into the atmosphere is commercial air travel. A typical trans-atlantic flight dumps the equivalent of three tonnes of carbon dioxide directly into the upper atmosphere. There are approximately 60,000 commercial flights every day. The United States is currently overhauling its aging air traffic control system in an effort to allow three times as many planes to operate by the year 2025. China's greenhouse gas emissions have risen 77 percent since 1990; it will surpass the United States as the world’s largest emitter of carbon dioxide by 2009, a decade ahead of previous predictions. A big reason is the explosion in the number of automobiles, but the main reason is China’s ravenous appetite for coal, the dirtiest of all the fuels used to produce electricity. Already, China uses more coal than the United States, the European Union and Japan combined. Every week to 10 days, another coal-fired power plant opens somewhere in China, with enough capacity to serve all the households in Dallas or San Diego. All of these plants are being built along traditional lines, burning pulverized coal to make electricity. There’s a much cleaner coal-burning technology available. Known as IGCC — for integrated gasification combined cycle — this cleaner technology converts coal into a gas before it is burned. These plants produce fewer of the pollutants that cause smog and acid rain than conventional power plants do. More important, from a global warming perspective, they also have the potential to capture and sequester greenhouse gases like carbon dioxide before they enter the atmosphere. This new technology is not readily available in China, but it is available to utilities in the United States. TXU, a giant Texas energy company, intends to build 11 new coal-fired power plants in Texas plus another dozen or so coal-fired monsters elsewhere in the country. In the United States generally, 40 coal-fired power plants are likely to start up within five years, the biggest wave of coal plant construction since the 1970s. The texas plants alone will more than double the company's carbon dioxide emissions, from 55 million tons to 133 million tons a year. TXU could use the newer, cleaner, IGCC technology but it is not. TXU will use the old pulverized coal model. The company says the older models are more reliable. But the real reason it likes the older models is that they are easier to build, cheaper to run and, ultimately, much more profitable. So, like the Chinese, TXU and other American energy utilities are locking themselves (and the country) into at least 50 more years of the most carbon-intensive technology there is. The U.S. Energy Department says there are 159 new coal-fired power plants on the drawing boards country-wide; of these, only 32 are considering — though not committed to — technologies that could significantly reduce carbon dioxide emissions. -- Adapted from articles in the New York Times and the Washington Post, January, 2007.
credibility, regardless of the actual situation. Gwynne Dyer.